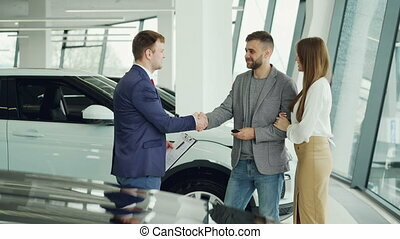 Succesful young man is buying car for his wife shaking hands with male dealership agent then kissing attractive woman who is getting key fob from cheerful salesperson. 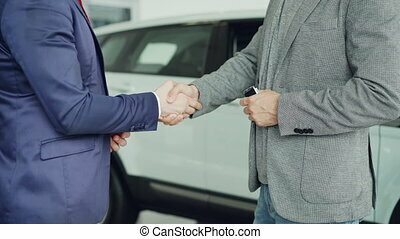 Motor showroom employee is giving car key to young male buyer and shaking hands, dealer is holding documents and gesturing. 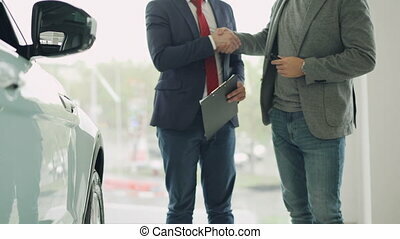 Selling and buying luxury transport concept. 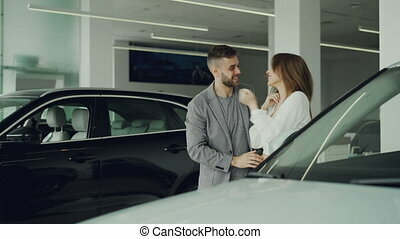 Loving husband is giving car key to his happy wife while sitting inside new automobile with nice interior and leather seats. 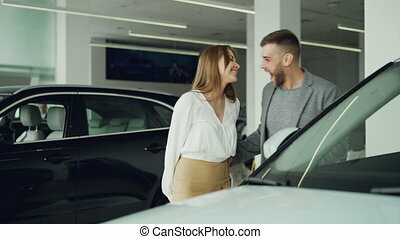 Excited woman is kissing him holding steering wheel. 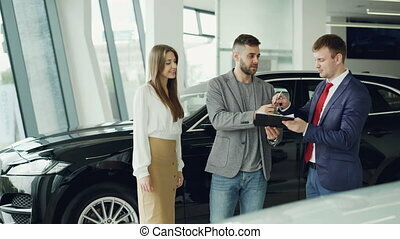 Male worker of car showroom is giving car keys to buyer stylish young man and shking hands with him standing beside luxurious new car. 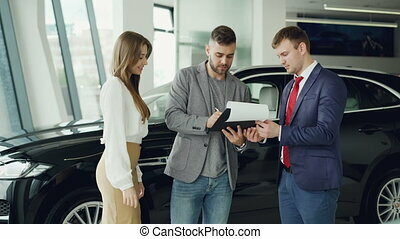 Selling and buying vehicles concept. 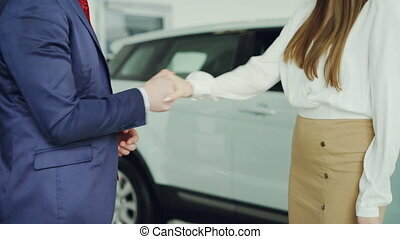 Slim young woman is getting car keys from salesman in suit then shaking hands with him to celebrate successful deal standing beside luxurious new automobile in motor showroom. 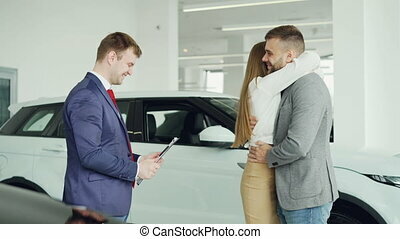 Point of view shot of young happy couple have online vidoe call in dealership after purchasing car. 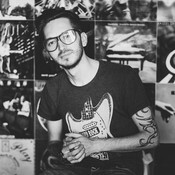 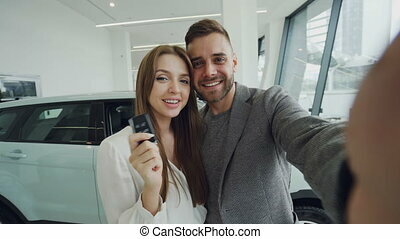 Man is holding camera and woman is showing keys, they are talking and kissing. 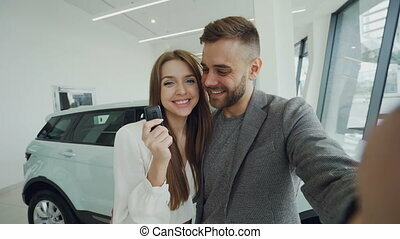 Attractive young couple is taking selfie with car keys in modern motor showroom after buying new automobile. 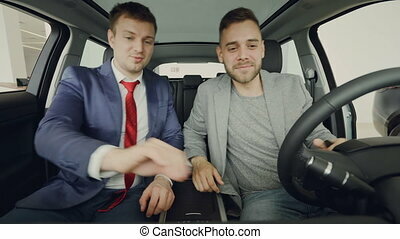 They are looking at camera, posing, kissing and smiling. 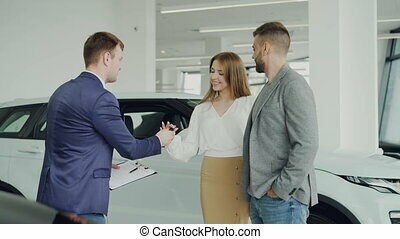 Attractive young woman is getting new car from her loving boyfriend, he is closing her eyes and leading her to auto in motor dealership, they are hugging and kissing.